Once you create your Performance Review, it is time to pick the reviewers and launch the review to your team. When the review is awaiting launch, you will see the corresponding status next to the Review's title on the Reviews page as following. Simply click on the Review to begin. 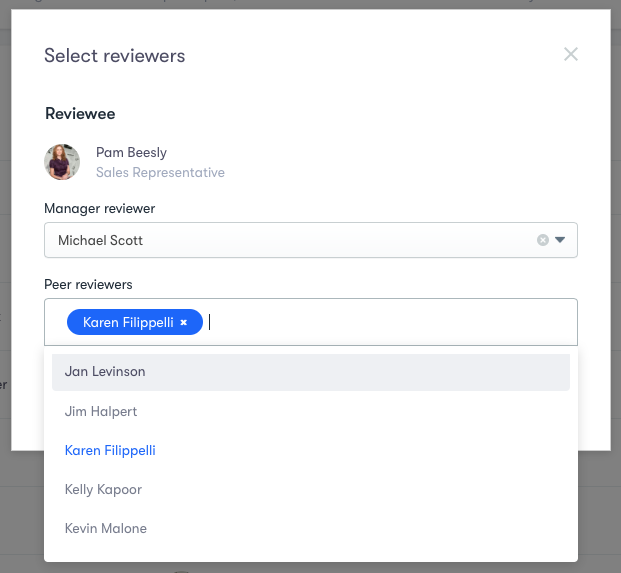 Before launching the review, you need to select the people who will be reviewing each employee. Click on 'Select reviewers' next to an employee's name to open a modal window and start this process. You will notice that the Manager reviewer has been already pre-selected by the system. That's based on the person specified in an employee job record under their profile. You can overwrite it by choosing a different person from the dropdown menu. Next, select Peer reviewers in the section below. After you finish selecting the reviewers for all employees and no further edits need to be made, you will be ready to launch the review. 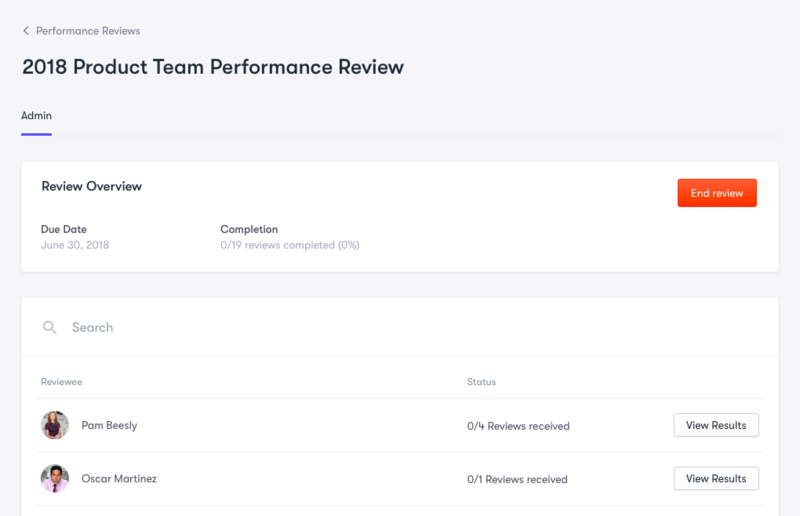 Click on 'Launch review' in the top right corner, which will bring a confirmation window to finalize your review before sending it to your team. The last step is to choose a due date for your review. 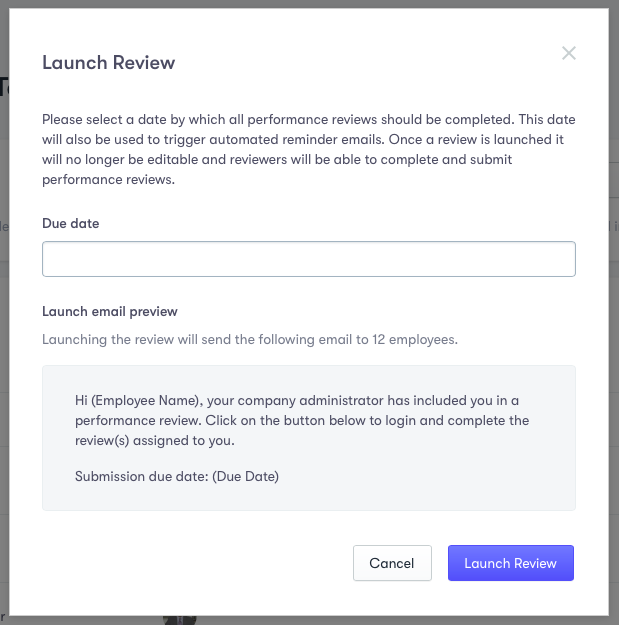 While the system will not end the review automatically, the due date you select would be communicated to your team and automated reminders will be triggered for any past due reviews. 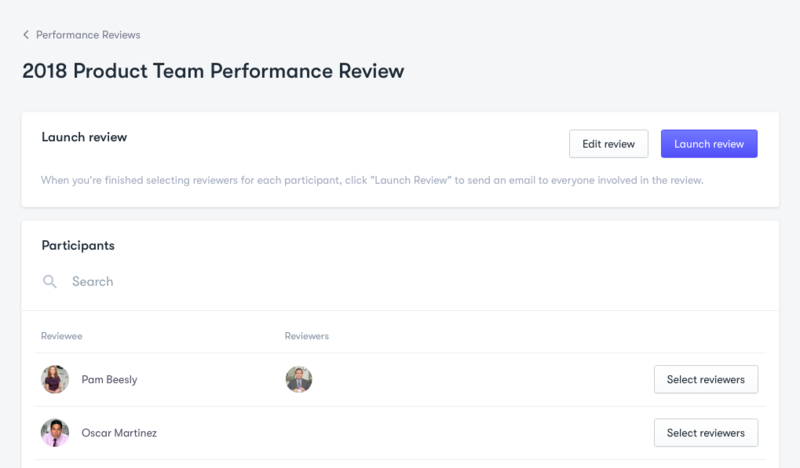 When you are ready, click on 'Launch Review' to send the launch email to all the participants and set start the counter for the review process. Now that your review is live, you will be able to monitor the completion of the reviews and view the results as they come in.